When you’re running a presentation, having a way to direct someone’s attention can be essential. Not only in the interests of professionalism, but in the interests of effective communication. Which is why devices like laser pointers can be essential for an effective presentation. But lasers aren’t always the right tool for the job. 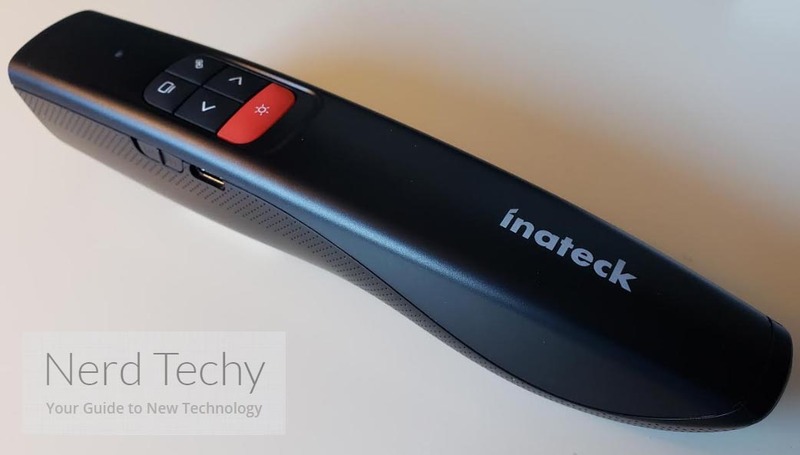 The Inateck LED Wireless Presenter was made mostly for group meetings, classrooms, organized presentations, and similar professional settings. Though this device is really only made for indoor use, it would be a stretch to call this wireless presenter limited. It’s just a different type of tool, with a different range of capabilities. How does it compare to using a laser? Well, the light source is an LED. 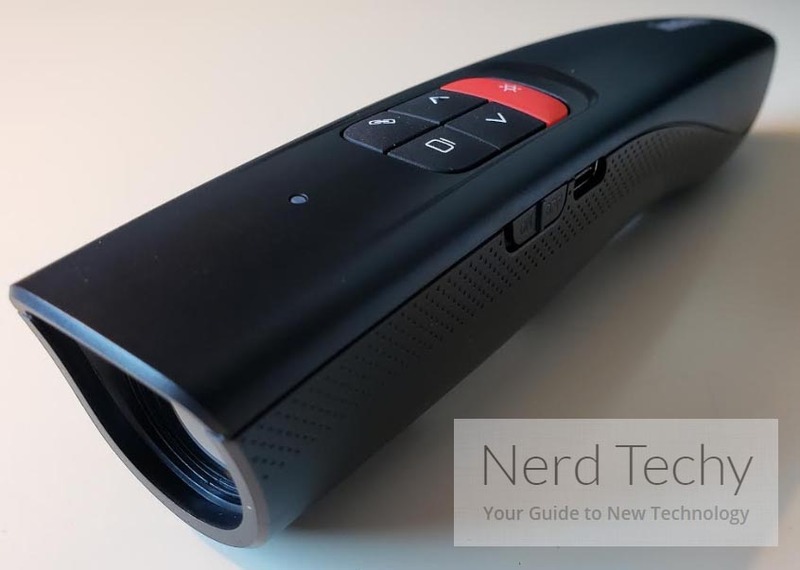 While a laser pointer creates a tiny point of light that’s roughly 2 millimeters in diameter, the Inateck LED Wireless Presenter highlights a larger area that’s around 2.5 centimeters. Pretty close to the diameter of a quarter. That can make the point you want to highlight much easier to see because it’s more than ten times larger. It can also be much easier to highlight specific areas, effectively working more like a visual highlighter. However, LEDs are not the right tool for every job. It’s important to recognize that even with a world-class LED wireless presenter, you’re going to end up with limitations. This tool was not made for outdoor use. If you’re trying to use a device like this for a presentation that’s going on outdoors, that’s when you’re probably better off with a laser pointer. At least, if there’s daylight outside. Because a laser beam is strong enough to be seen while outside during the day. But an LED light like used in the Inateck LED Wireless Presenter is about as visible as turning on a flashlight during the day. Of course, that intensity is also what makes lasers so dangerous. In fact, that’s one of the best reasons to use an LED light source instead of a laser. LED devices are far, far safer. Because an LED wireless presenter can be built such that light is scattered in a harmless manner. While with a laser, exposure can cause permanent eye damage with direct exposure in only a fraction of a second. Apart from the outdoors, there’s another more territory where wireless presenters tend to have significant limitations. For essentially the same reasons that daylight is a problem, wireless presenters like the Inateck LED presenter are not made to work with LCD screens. Television screens, monitors, and other displays throw off a lot of light. 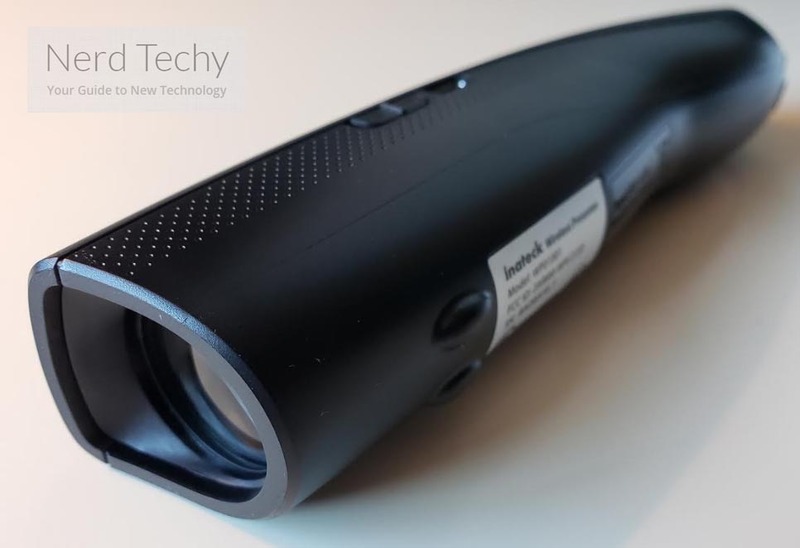 The Inateck LED Wireless Presenter just doesn’t have enough power output to make its light visible on an intensely backlit screen. Once again, it’s like shining a flashlight on the screen. Unless the flashlight is extremely bright, you’re probably not going to see much light. Notably, for a projected image, you may actually use this wireless presenter with some success. That success would be mitigated when working with exceptionally bright projector equipment. And it is mostly high end equipment that has the ability to be bright enough for that. The Inateck LED Wireless Presenter measures 7.1 x 1.4 x 1.5 inches, and weighs just shy of one pound. Most of that weight is the result of the built-in battery. The battery is a 2600mAh rechargeable lithium-ion cell. Pretty powerful stuff that’s been crammed inside the relatively small space of the wireless presenter’s body. Internally, the battery takes up about 25% of the entire device. But its weight is mostly shifted towards the handle portion of the unit, so it feels natural in your hands. Because this presenter was pretty clearly made to be handheld. From the remote-like shape of the device, to the way they’ve shape the device, to the carrying strap, there’s nothing about this remote that conflicts with portable use. Notably, the included lanyard strap can be removed or replaced as needed. It runs about seven inches in length, and provides plenty of adjustable space. However, if you’re interested in using this presenter in a more stationary manner, that is also possible. 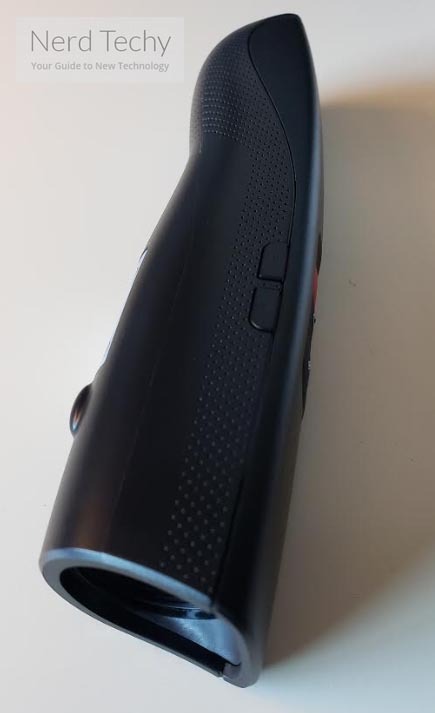 While most laser pointers are made with some kind of round body that’s far from ideal for stationary use, this LED wireless presenter was constructed with a bulge on the backside. The bulge is perfect for helping you to place the unit on a flat surface and keep it steady. 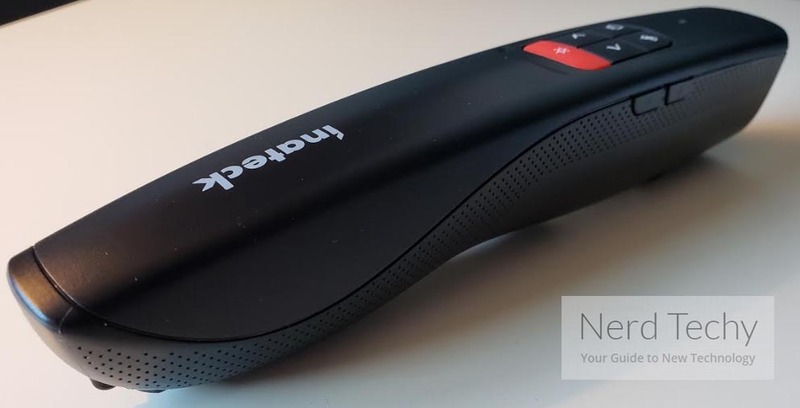 Once you’ve got the Inateck LED Wireless Presenter in your hands, one of the first things you’ll notice is how the device has far more than a single button for the light. There are actually a number of different function buttons. That might seem a little intimidating compared to a one-button laser, but the interface is still pretty intuitive. The topside has four function buttons and one large activation button for the light. The activation button is highlighted in orange, helping it stand out from the others. The function buttons are a very cool idea; they were all designed rather specifically with people who are giving presentations in mind. For instance, there’s a full screen button, a hyperlink access button, a shortcut button, and pair of page up/down buttons which double as volume buttons. Between them, you have full support for PowerPoint, Google Slide, and a number of similar applications. Pretty ideal for making a variety of different presentations without getting locked into a single ecosystem of software. There’s not much left to mention about the user interface. But on the side of the unit, you’ll notice an on/off switch next to the USB charging port. It’s odd they decided to make the on switch separate from the off switch. They could have just as easily made it one large multi-function button, but to each their own. 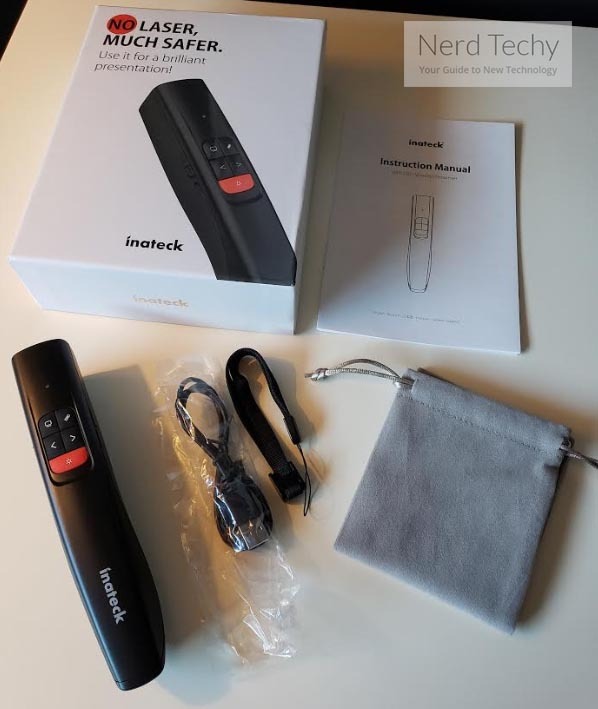 The Inateck Wireless Presenter gets its connectivity with the aid of a 2.4GHz wireless signal. But because there’s no beamforming involved, this wireless signal performs basically the same as a Bluetooth signal. With an effective connection distance of about 90 feet, you won’t have trouble spreading your signal across a large room. But you won’t be able to get that signal to transmit through walls or other bulky objects. You basically have to treat this wireless presenter as you would a wireless mouse or an infrared television remote. 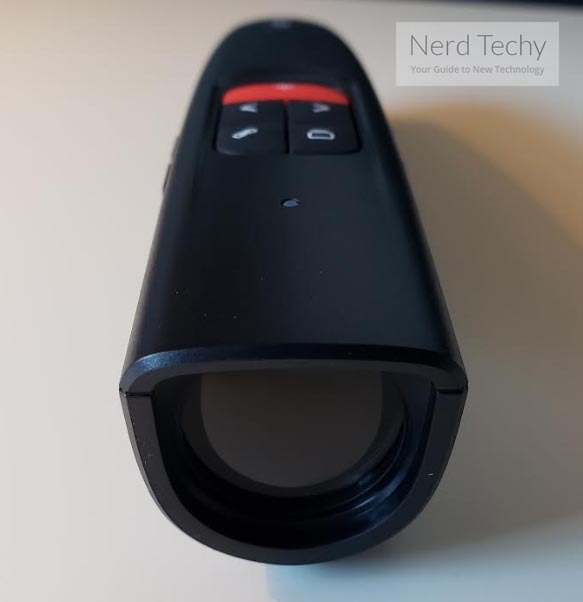 Additionally, the connectivity requires you connect a tiny USB dongle to whatever you want the wireless presenter’s buttons to interact with. The size of the adapter is quite similar to the adapters you see used by wireless mice. The outside of the fact that the adapter is pretty small, it’s worth noting it was constructed with plenty of gripping space on both sides. Pretty useful for people who actually intend on retrieving their adapter from whatever it’s plugged into at some point. Depending on your operating system and the program you’re trying to use to present, you’ll find some of the presenter’s button features won’t work. Windows and PowerPoint has flawless support for everything on-offer. But Google Slides doesn’t support the full screen button or hyperlink button, Keynote doesn’t support the hyperlink button, and LibreOffice Impress and Calligra Stage don’t support the volume up/down button or hyperlink buttons. The Inateck LED Wireless Presenter is constructed around a 2600mAh rechargeable lithium-ion battery. Compared to using a laser device, that’s certainly far more convenient than having to deal with replaceable batteries. And since this device makes use of an LED light source, with the help of that relatively large battery, this wireless presenter can get quite a bit done. LEDs are wonderfully power efficient, so as long as you’re not trying to use this presenter as a flashlight, you should easily be able to get months of capacity between charges. Though in the interests of keeping the battery in great shape, a refresher every few weeks can help. The included user guide can help explain a bit more. This kit includes the Inateck LED Wireless Presenter, a lanyard strap, a short 8” USB Type-A to micro USB charging cable, a carrying bag, and a user manual. For the most part, the user manual isn’t very useful, not even if you’re using one of the less common operating system setups. But if you don’t need a refresher on how to take care of rechargeable batteries, you’ll find that this device is intuitive enough that you can probably just toss the manual when you see it. The carrying bag is nothing special, and for a lot of people, this bag will also probably be thrown away. Because with the included lanyard strap, the bag really adds no extra portability. The bag is also made of a cloth-like material that doesn’t add any water protection, either. However, the lanyard strap is adjustable, so there’s not much room for complaint for the form of portability that matters most. Just about anyone should be able to make use of the included strap. And since Inateck decided the strap didn’t need to be built-in to the chassis, it’s possible to remove or replace it as necessary. Pretty useful. Who Should Choose the Inateck LED Wireless Presenter? This presenter is capable of bringing a number of things to the table. For starters, it’s widely adaptable. Going to be using a system based on Mac? You’re covered. Using Windows? You’re covered. 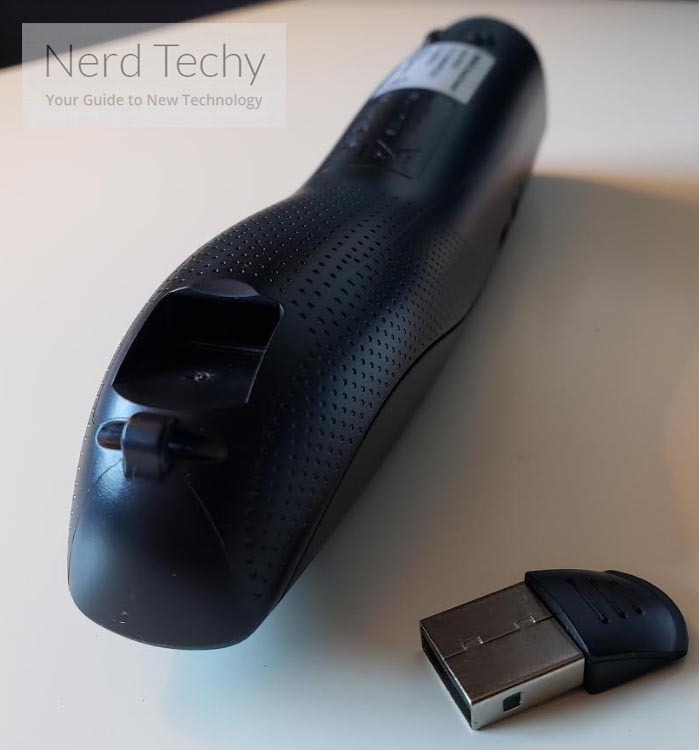 If you’re someone who’s dedicated to a Linux system, there might be a reason to hesitate to get the Inateck LED Wireless Presenter. But there would still be reasons to use it, even with Linux, because the core functionality is still there. All in all, it’s fair to say the device itself is smartly designed. From its handheld nature to its ability to be recharged, there are many things to like. You can keep the battery going for months on end because LEDs are insanely efficient. And compared to lasers, this presenter is pretty much totally safe. Because you’re not projecting a high energy beam, you don’t have to worry about burning through battery power or eyeballs. There are a few places where it would make more sense to stick with a laser device. When you’re outdoors in the middle of the day, or you’re giving a presentation on an 80” LED television screen, then the right tool for those jobs is probably a laser. But for everywhere else, the Inateck LED Wireless Presenter has some pretty compelling things it can offer.